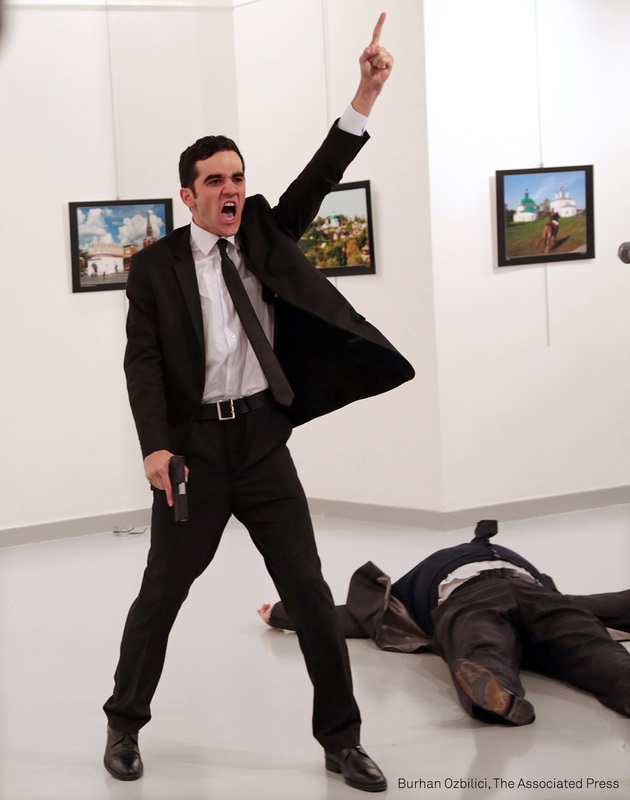 © Burhan Özbilici, Mevlüt Mert Altıntaş shouts after shooting Andrey Karlov, the Russian ambassador to Turkey, at an art gallery in Ankara, Turkey. Most of us will agree on one thing: this year’s WWP winning photograph is not their typical choice. But that’s it! The consequences of this choice are as multilayered as the photograph itself. One of the first persons to speak openly about why this photograph “should not have won such a prize” was the chairman of the judging panel: Stuart Franklin. In an opinion article, published by The Guardian, Franklin describes the event that is depicted in Burhan Özbilici‘s winning photograph as a murderous spectacle. Franklin adds that this is only the third time a register of an assassination wins the prize. For Franklin, awarding the photograph of a murder poses a moral problem. Sorry, that’s not really what he says. In fact, his words are: It’s a photograph of a murder, the killer and the slain, both seen in the same picture, and morally as problematic to publish as a terrorist beheading. I don’t like to give in to cynicism, so I’ll hold back my worst self and just say that I smiled when I first heard this. Sorry, Franklin, but the idea that a competition such as WWP should not beautify and promote our worst selves is ludicrous. The only reason why some photographs have traveled the world with the WWP exhibition is because they were made famous at the expense of the dead bodies represented in them. And those lifeless bodies were only seen, contemplated and appreciated because they had an aesthetic dimension, they were beautified and through that transformation evil was made redundant. That, as I see it, poses a moral problem, because it compromises the dignity of the people in them. But Franklin means what he says. Not only does he disagree with the photograph of an assassination being the winner of the year, he also opposes the message it sends out to the world: Placing the photograph on this high pedestal is an invitation to those contemplating such staged spectaculars: it reaffirms the compact between martyrdom and publicity. I confess his honesty and ingenuity surprise me. And I understand where he comes from. In Franklin’s perspective, the winning photograph should testify to a less visible reality and it should expose, be a call for action, inspire change, so he says. But let’s go back to that day: 19/12/2016. Özbilici, a Turkish photographer, is attending a press conference by Russian ambassador that was happening in a gallery in Ankara. One should stress that being a photographer in Turkey is to be part of the resistance, for that country’s liberty is long gone. What happened next is history: while the ambassador, Andreï Karlov, was speaking, Mevlüt Mert Altintas, a 22 years old off duty police officer working security for the event, shot him. He shot him 9 times and claimed to be punishing Russia for its intervention in Syria. Being there, Burhan Özbilici made the decision to photograph and his shots immediately traveled the world. I saw the winning photograph the following day and I remember it clearly. I was extremely surprised, I showed it to my partner and we had a wee chat about it. At the time, what surprised me had nothing to do with the event itself. What astonished me was the contradictions at place, how different forces and dynamics had made it into one picture. Still, to this day, what I think makes this photograph so great is that it is iconic. And being iconic means we’re talking about its aesthetic value. It’s almost as if this photograph should not be understood as photojournalism, for it has too many hidden layers, too many subtleties. Basically, it’s too brilliant to be reduced to its role as proof. I think a large part of my inability to fully process the images from Turkey has to do with a kind of category error. They should, I tell myself, be documents of an atrocity, the kind of images we’re bombarded with all the time, and to which most of us have, perhaps at some cost to our humanity, developed antibodies. We see mediated atrocity every day. We tell ourselves we care, and perhaps we do. But generally we look at the wreckage, the carnage, the suffering faces, and we move on. This time, though, I’m having a hard time moving on, because I don’t just see the images as documents of atrocity. I also see them as aesthetic, and that doesn’t sit easily with the other way of seeing them. Indeed, it feels immoral. It feels wrong. In the strange combination of urgent action and an uncanny suspension of motion, they are reminiscent of some of Jeff Wall’s photographs (1984’s “Milk,” for example, or “Dead Troops Talk,” from 1994). Perhaps it is the dramatic nature of the poses — combined with the fact that they’re set against the stark, white background that instantly declares itself an art space — that makes the figures almost seem like an art installation. Perhaps an installation by Maurizio Cattelan, in line with his 2002 wax dummies of police officers, “Frank and Jamie.” If you begin to let yourself see the photos as works by Jeff Wall, they seem to show the calm at the heart of violence. If you begin to look at them as photos of an imaginary Cattelan installation, you start to think of them as meditations on the nature of exhibitions. But if you do either — and I have done both — you might find yourself uncomfortable to the point of queasiness with your own slip into aestheticizing. The atrocity is real. The violence is real. The death is real. And the photos? They’re so good, they almost don’t let you see that. They’re so good they make you feel bad to have shifted your attention from the moral urgency of bloodshed to the composition itself. They’re so good they make you wonder about the cruel indifference of beauty. They’re so beautiful that they lift you from the real to the aesthetic, so true they send you plummeting right back. There’s nothing we can do about our visual culture and backgrounds, so it’s inevitable that for those familiar with references such as the ones mentioned by Robert Archambeau, this photograph jumps between categories and tends to reject the most obvious one: that which gave it the WWP prize. Where I differ from Archambeau is that I don’t have any remorse. And why is that? It’s complicated, of course, but as I’ve mentioned many times before, I think contemporary photojournalism is condemn to fail. It hasn’t always been like this. Before the wars were televised, before cellphones had cameras, photography held that status of “authentic proof”. Now, the most authentic imagery seems to come from the perpetrators themselves. They photograph their victims as trophies and those images are also good examples of the hatred that rules this era. But they are not conscious photographs, only digital images. In most of the cases, there is no author behind them; that maker is so morally compromised that one could not recognize him authorship. What this era might well do to photography, as an autonomous expression, may actually be what we’ve been waiting for. And maybe Özbilici’s photograph could trigger that debate, because photography is not an automatism, it is not a machine, and there’s always an aesthetic dimension to every image. Maybe if we don’t potentiate that dimension we will just keep talking about realism and objectivity, where instead we should be speaking about fiction and subjectivity. Bom texto Sofia. Estás em forma! Ainda não li os outros para trás. Obrigada, Duarte. Não conhecia. Ando sempre um pouco distante da ASX (sem que isso seja intencional). Discordo bastante dele, mas gostei muito de o ler (dava o mote para outro post). esse texto é de um que mais gosto de ler, acho que já tinha falado dele. gostava de um dia convidar a escrever para a propeller.